Hawk Hill’s gardens are home to many flowering plants, but by late summer in Missouri, there’s not much that hasn’t gone to seed, so my vases are usually empty. One day I realized that even though my flowerbeds were empty, there were lots of colorful and unique plants- even weeds- on the property and maybe I could use these native plants to create beautiful “flower” arrangements for free. An herb bouquet of sage blossoms and fennel basking in a sunny spot in my studio. Pleased with that result, I jumped at the opportunity to be even more creative when I had a big group of house guests come in the fall. 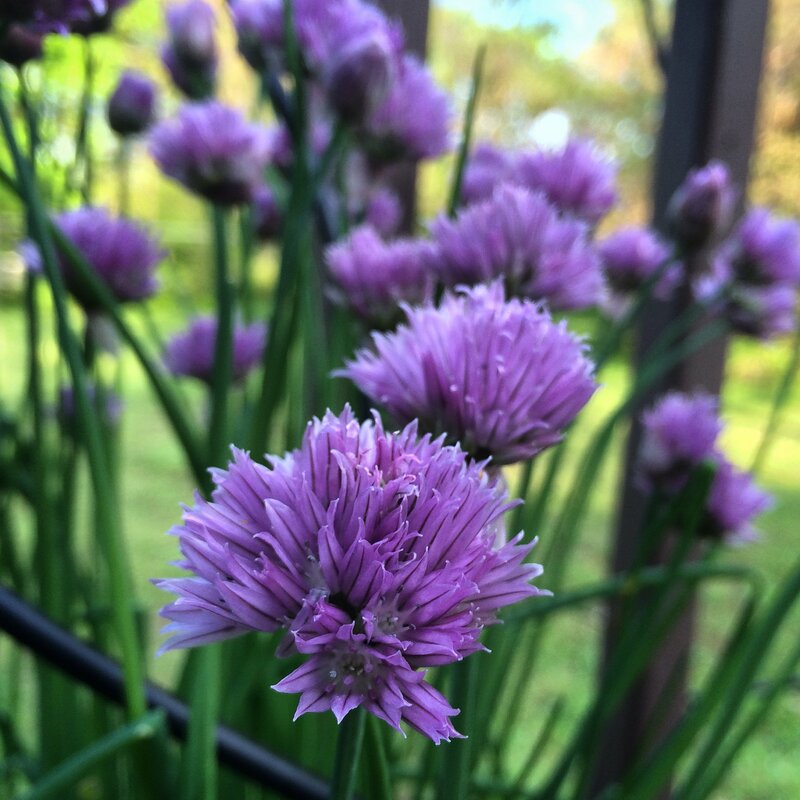 A chive blossom makes lovely study, placed in a bud vase. 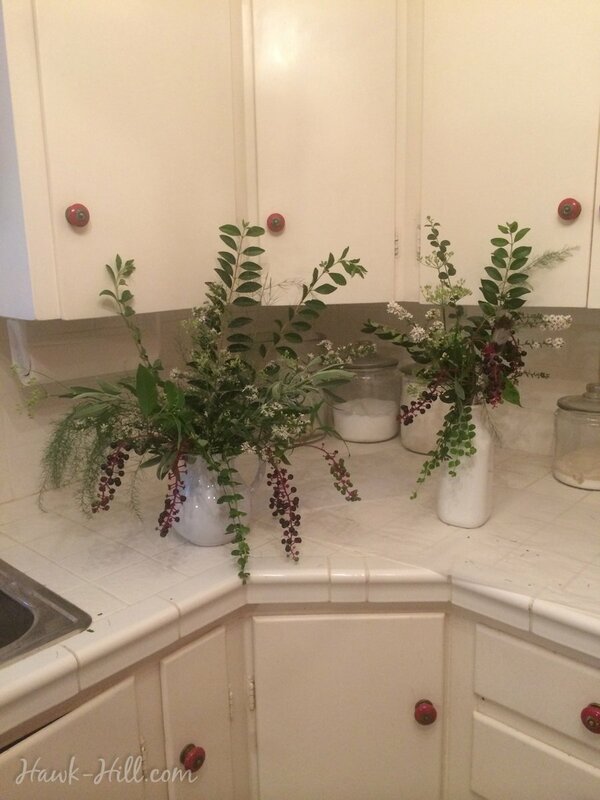 After collecting clippings, I spread them out on newspapers on a large table in my garage, gathered a few vases, and started arranging my non-flower arrangements. Basic flower arranging rules still applied: countering tall with short, balancing from side to side, contrasting colors throughout, etc. Unique to my “weed bouquets” was that instead of balancing blossom colors and styles, I was balancing shades of green with lighter shades of green, delicate vines with more robust branches. Grab a bucket and, being careful to avoid thorns and poisonous plants, begin to collect bits of growth 10-18 inches long. Look for interesting flora, but don’t ignore less flashy growth because it’s ordinary. Common greens can make nice filler or may even carry a particular beauty when placed in an indoor arrangement. If you have particularly delicate branches, like branches with berries still attached, save till last, and then gently add. Play and rearrange, till you love it! Late summer weed bouquets in Missouri. I wish I could narrate the native plants I used for this bouquet, but I don’t know the names of most. Furry sage leaves and delicate fennel seed pods are included, as well as clippings from my planted landscaping and lots of native wild growth. The berries are from an invasive and poisonous-if-eaten plant called Pokeweed. 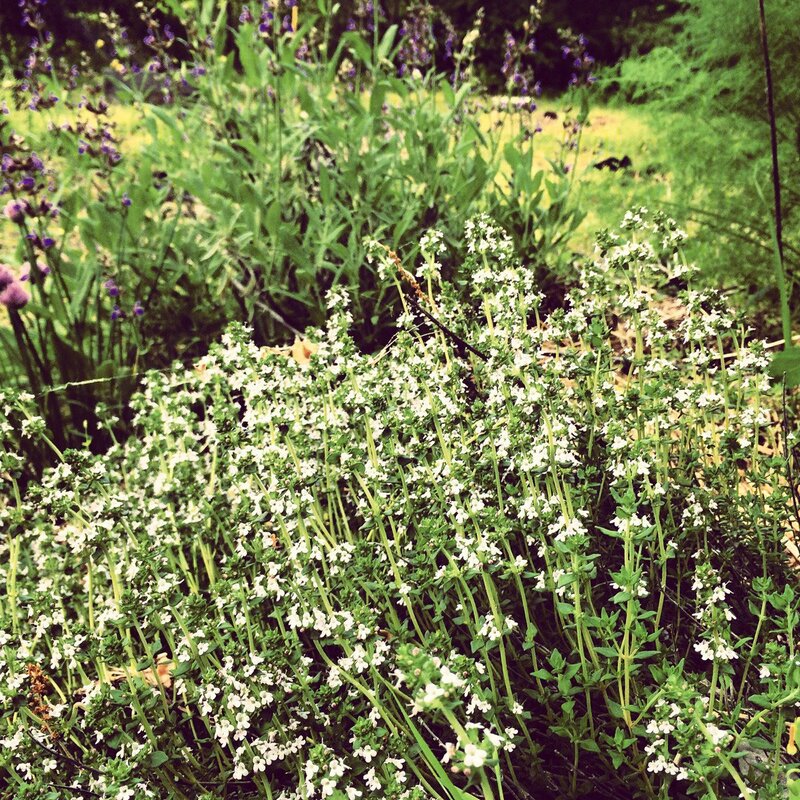 I let the perennial herbs in my garden run wild. In this photo the tiny white flowers are thyme blossoms, the round purple blossoms on the left are chive blossoms, the purple blossoms dominating the upper left are sage blossoms, and the green fronds at upper right are fennel fronds. 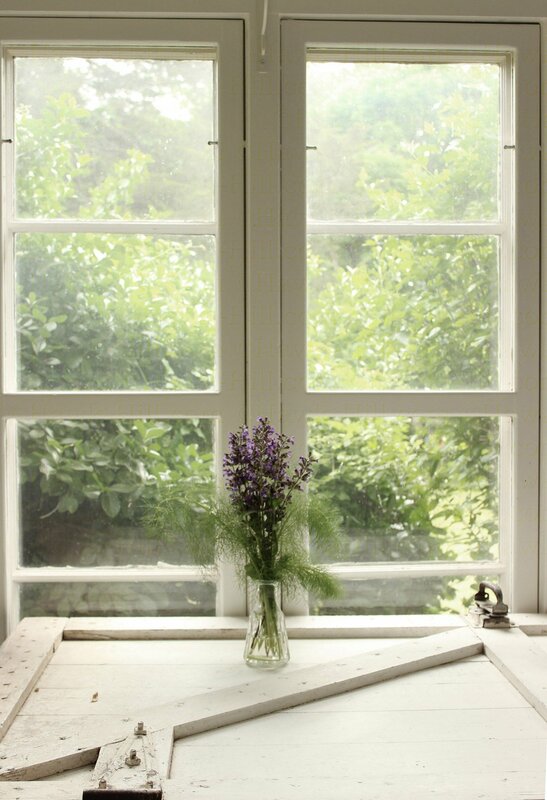 There is never a shortage, and always enough herbs to cut, bundle, and gift (or in the case of sage, bundle and burn for a fragrant campfire), or cut, dry, and use over winter. As they grow larger, many herbs spread underground and are easier to divide at the root. To create a free but always appreciated housewarming gift of a planter filled with herbs means I just need a shovel! 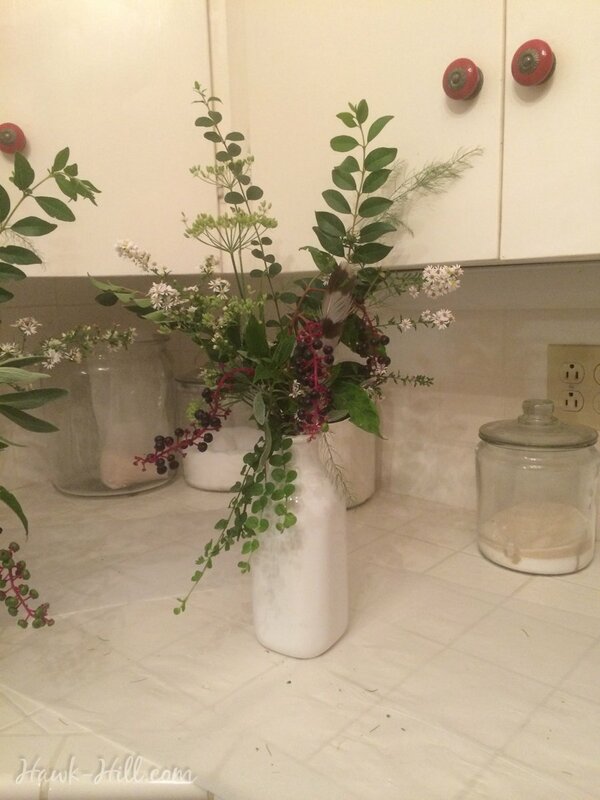 The extra growth of the unique leaves and blossoms of herbs are beautiful sniped and placed in bud vases or as additions to week bouquets. One more closeup of one of my weed bouquets featuring moneywort, pokeberry, sage, fennel blossoms, and (do you see it?) a hawk feather found while harvesting greens to arrange!